This post is from our friend Cassy. You can follow her on twitter @_MAF29 and she is a writer for Pens Report while we enable her hockey addiction here as well. The Penguins aren’t exactly known for having a strong prospect pool, but that doesn’t mean it’s completely void of talent. Here I will list the top 5 prospects in the organization in a sort of “Power Rankings” style. 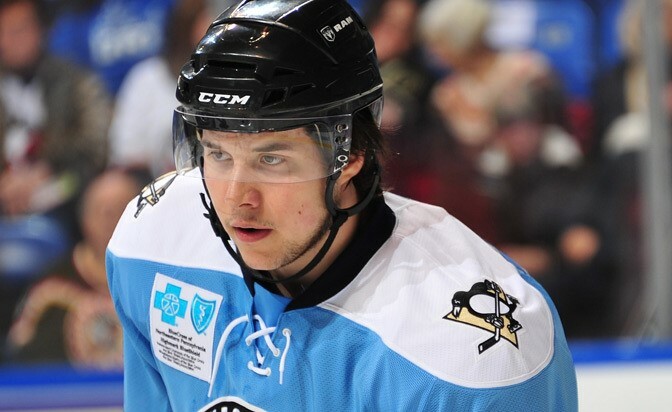 NHLers such as Daniel Sprong, Sergei Plotnikov, Brian Dumoulin (et cetera) will be excluded. This really shouldn’t come to the surprise of anyone. Murray has not only played to his potential expectations, but some may say he has exceeded them. Through 8 starts, Murray is 7-1-0-0. He carries an impressive 1.75 goals against average (3rd in the AHL) and a save percentage of .946 (2nd in the AHL). Both of these statistics are downright ridiculous, and it goes to show how incredible the goaltending is in the Pittsburgh organization (another man will be proving that later on). Murray’s 7 wins are also tied for 1st in the AHL with Peter Budaj of the Ontario Reign, and is tied for 6th in shutouts with a plethora of goaltenders, with 1. 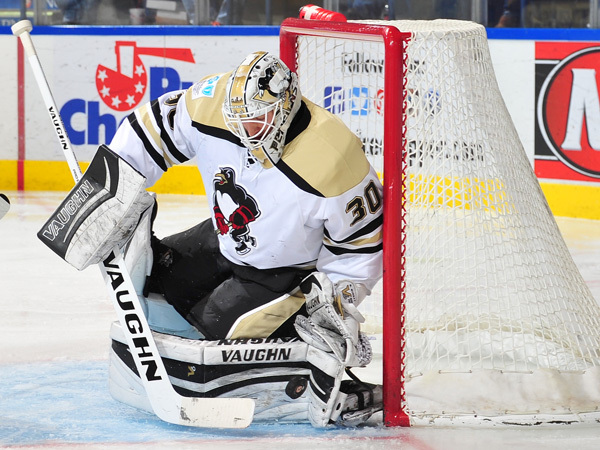 Murray continues to reign supreme in the AHL, and is undoubtedly making himself worthy of being the goalie of Pittsburgh’s future. Simon has been nothing but pleasant surprises for Pittsburgh brass and more immediately the Wilkes-Barre/Scranton Penguins. Not only is this the 21 year-old’s first season in the AHL, but it’s also his first season playing pro hockey in North America, meaning new rink sizes and different play styles. Considering this, his start to the season is just great. In ten games played, primarily on the right wing of Carter Rowney and Tom Kuhnhackl, Simon has 5 goals and 5 assists, 2 of them being primary assists. 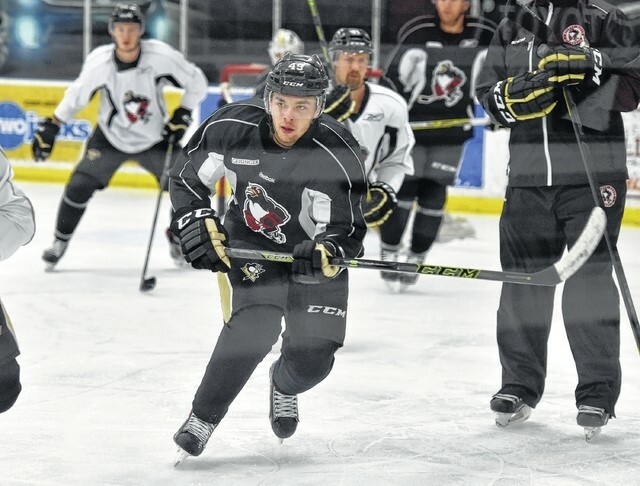 Simon is tied for the scoring lead on the Wilkes-Barre/Scranton Penguins, and is also tied with Nick Ritchie for fourth in the AHL in rookie scoring. The Czech forward is truly an impressive player, and could potentially be another steal of the 2015 NHL Entry Draft for the Pittsburgh Penguins. Bravo, Rutherford. Wilson would likely be first if not for the fact that Simon is doing so well considering it’s his rookie year in both the AHL and pro North American hockey. Similar to Simon, Wilson is currently tied for the WBS Penguins scoring lead with 10 points, however he has only played 9 games. He leads the club with 6 goals and also has 4 assists, 2 of the 4 being primary assists. While he may not have the highest ceiling of the Pens’ prospect pool, Wilson is perhaps the most NHL-ready forward prospect of the group, and continues to show it. Wilson is usually on the top line with Kael Mouillierat and Conor Sheary. Yes, something happened. No, it did not and will not affect how I view Pouliot. He is a 21 year old who had a drink. He’ll learn from it and move on. ANYHOW! This man continues to be an anchor for the Wilkes-Barre/Scranton Penguins, continually being on the top pairing with Steve Oleksy. Through 9 games, Derrick has 2 goals and 6 assists, 4 of them being primary. A defenseman averaging .89 points per game is pretty ridiculous, and it goes to show how offensively talented this young man is. Pouliot is tied for 6th among defensemen in point production, and averages around 23 minutes per game. While still working on his game in his own end, Pouliot continues to show potential to be that top four defenseman he knows he can be – and even better – a deadly powerplay anchor, Sergei Gonchar-esque. Another goaltender? Yep. Another goaltender. Even though he has only started twice, Jarry is doing very well in his rookie AHL season behind Matt Murray. Through those two starts, he has carried a goals against average of 2.00 and a save percentage of .938. For a goalie transitioning from the WHL to the AHL, this is rather impressive. He only adds to the ridiculous goalie depth that the Pittsburgh Penguins have.